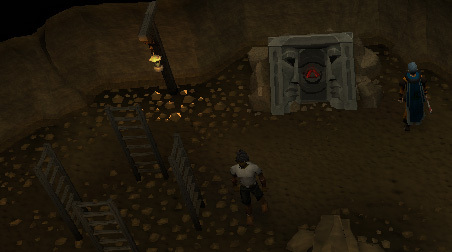 The Mining Guild Resource Dungeon was released on 19 July 2010 as part of an expansion to the Dungeoneering skill. This resource dungeon is only accessible to players with a Dungeoneering level of 45, and for a good reason: it is one of the few places in free-to-play RuneScape where freeplayers can mine Runite. A Falador Teleport should help to get there quickly. If you have the Explorer Ring 3 or 4, you'll be able to Cabbage-port and then run to the Mining Guild. There is also a Musician nearby to restore your run energy if necessary. 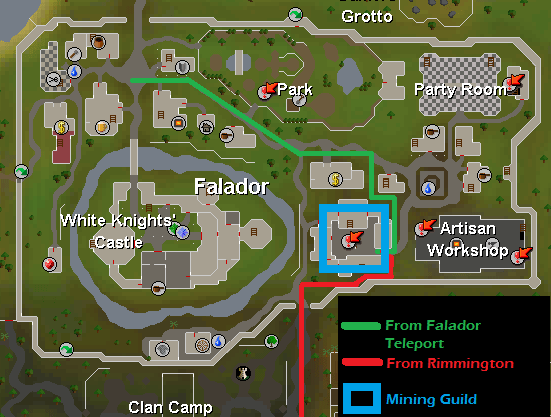 Head to the northeast area of Falador and prepare to enter the Mining Guild. Now, with level 60 Mining (or level 59 and a Dwarven Stout in hand) climb down into the guild. To the south of the entrance ladder will be the entrance portal to the resource dungeon. Just click on the entrance portal and you will be teleported to the resource dungeon. If this is your first time, you'll earn 4,400 bonus Dungeoneering experience. 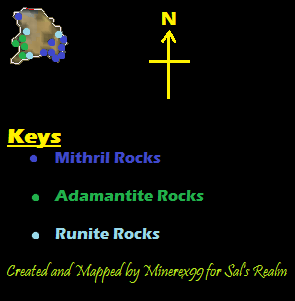 The resource dungeon offers 3 Runite rocks, 4 Adamantite rocks, and 8 Mithril rocks to mine. It is often difficult to find Runite rocks un-mined in a non-members world. Take your time hopping to less crowded worlds. 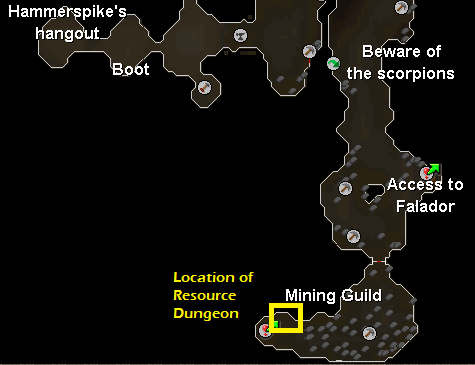 It is worth noting that, to date, this resource dungeon is the safest location in free-to-play RuneScape to mine Runite, as players do not need to worry about the threats of mining in the Wilderness.